Police issue anti-social behaviour forms to youths in Houghton. Police in Sunderland say they have identified a large group of youths causing anti-social behaviour. Officers in Houghton said after working in conjunction with schools in the town they have been able to identify the youths for residents. A spokesman said: "We have spoken to these youths and warned about future conduct in the community." He said Gryphon forms have been issued to the youths. 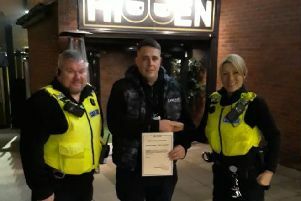 Launched a few years ago Operation Gryphon is a three level approach to help curb anti-social behaviour and sees police and partners use legislation available to tackle anti-social behaviour. The forms mean police and other agencies, such as housing organisations, can make joint visits to the parents of the children involved to talk to them about their child's behaviour.